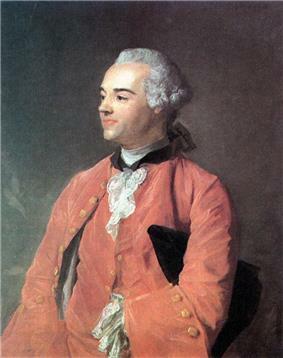 Jacques Cazotte (French: ; 17 October 1719 – 25 September 1792) was a French author. Born in Dijon, he was educated by the Jesuits. Cazotte then worked for the French Ministry of the Marine and at the age of 27 he obtained a public office at Martinique. It was not till his return to Paris in 1760 with the rank of commissioner-general that he made his public debut as an author. His first attempts, a mock romance and a coarse song, gained so much popularity, both in the Court and among the people, that he was encouraged to try something more ambitious. He accordingly produced his romance, Les Prouesses inimitables d'Ollivier, marquis d'Edesse. He also wrote a number of fantastic oriental tales, such as his children's fairy tale La patte du chat (The Cat's Paw, 1741) and the humorous Mille et une fadaises, Contes a dormir debout (The Thousand and One Follies, Tales to Sleep Upright 1742). His first success was with a "poem" in twelve cantos, and in prose intermixed with verse, entitled Ollivier (2 vols, 1762), followed in 1771 by another romance, the Lord Impromptu. But the most popular of his works was Le Diable amoureux (The Devil in Love, 1772), a fantastic tale in which the hero raises the devil. The value of the story lies in the picturesque setting, and the skill with which its details are carried out. With the help of the Syrian priest Dom Denis Chavis, he translated some Arabian legends into French for the fairy tale anthology Le Cabinet des fées (1788–1790). Cazotte possessed extreme facility and is said to have dashed off a seventh canto of Voltaire's Guerre civile de Genève in a single night. About 1775 Cazotte embraced the views of the Illuminati, declaring himself possessed of the power of prophecy. It was upon this event that Jean-François de la Harpe based his famous jeu d'esprit, in which he represents Cazotte as prophesying the most minute events of the French Revolution. Near the end of his life, Cazotte became a follower of the Martinist mysticism of Martinez de Pasqually, and became a "mystical monarchist". On the discovery of some of his counter-revolutionary letters in August 1792, Cazotte was arrested; and though he escaped for a time through the efforts of his daughter, he was guillotined the following month. A complete edition of his work was published as the Œuvres badines et morales, historiques et philosophiques de Jacques Cazotte (4 vols, 1816–1817), though more than one collection appeared during his lifetime. Cazotte's work was an influence on later fantasy writers such as E. T. A. Hoffmann, Charles Nodier, Gérard de Nerval and Théophile Gautier. Le Diable amoureux (The Devil in Love), 1772.
with an introduction by Storm Jameson, 1927. ^ a b c d The Arabian nights : A Companion. by Robert Irwin. London, Allen Lane, 1994, ISBN 0-7139-9105-4 (pp. 260–5). ^ Wells Chamberlin, "Jacques Cazotte" in Supernatural Fiction Writers, edited by E. F. Bleiler. New York: Scribner's, 1985, ISBN 0-684-17808-7 (pp.29–35). ^ The Arabian Nights in Transnational Perspective edited by Ulrich Marzolph. Wayne State University Press, 2007 ISBN 0814332870 (p.34). Francis Amery (Brian Stableford), “Cazotte, Jacques” in St. James Guide to Horror, Ghost, and Gothic Writers, ed. David Pringle. Detroit: St. James Press/Gale, 1998, ISBN 1558622063.